Are you ready to get rid of the winter blues and bring colour back into your home for Spring? It’s that time of year again; when we realise how cluttered our house is, from items that have been stacking up all winter. This can especially be seen in our kids bedrooms. Who knows what long lost items can be found under beds, in secret hiding places or in the depths of the cupboard. Grey is becoming the coolest colour of 2017. It’s neutral yet versatile, meaning it can be perfectly paired with any accessory colour and matches any style. You can’t go wrong! 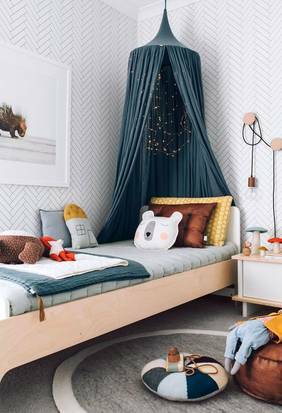 The first thing that will pop into a kid’s mind is ‘boring’ BUT simply add bold coloured accessories, bed covers, toys, and rugs to bring the room alive. It becomes a colourful playland for them, excites the imagination and doesn’t ruin the style of the house. 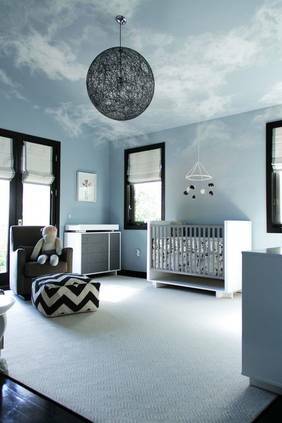 For ideas on how to add colour into a kid’s room, head to Designbx’s Incy Nursery. 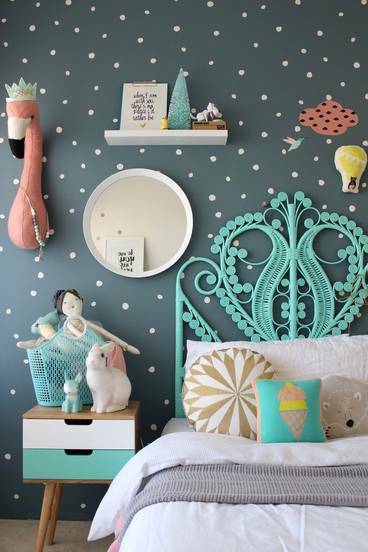 Allow your kids to personalise their room with the brand new Knot-a-Mermaid set, hitting the shelves this Spring. It enables kids to make their own fleece blanket designs and is only $27. Wallpapers were almost extinct, but their popularity is on the rise again. We’re not talking about the old floral designs that your grandma still has in her house, there are several new modern wallpapers that can fit perfectly with a modern home. Geometric prints go with a simple modern style, whereas large modern florals make a statement, especially for Spring. Try covering just one wall in wallpaper to make it a feature wall. If you then fall in love with the look, you can continue to do the rest of the room. 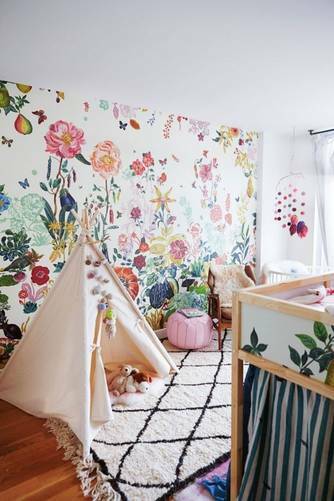 Wallpaper featuring wildlife, plants or flowers can be utilised in nurseries to give the room a peaceful, relaxing and natural feeling. Hopefully encouraging consistent long, deep sleeps! Instead of wallpapers, you can surprise your kid with a Skyrocket Jurassic World Virtual Reality set, where they can escape reality and immerse themselves. in a dinosaur experience. At only $60, you will want to get your hands on one of these. So often, our go-to colour for ceilings is plain, old, boring white. How many kids get excited and inspired by a plain white ceiling? Not many (if any at all). 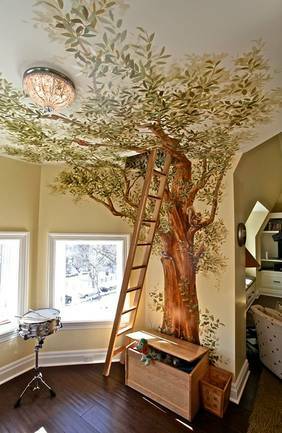 There’s no rule to say you can’t go beyond the four walls and design a ceiling that knocks their socks off. Get your creative cap on and start your roof masterpiece, but don’t worry if painting isn’t your strong point, there are plenty of other options. Wallpapers can seamlessly go from your walls to your roof and if you’re after something not so permanent, decals are easy to apply and change. 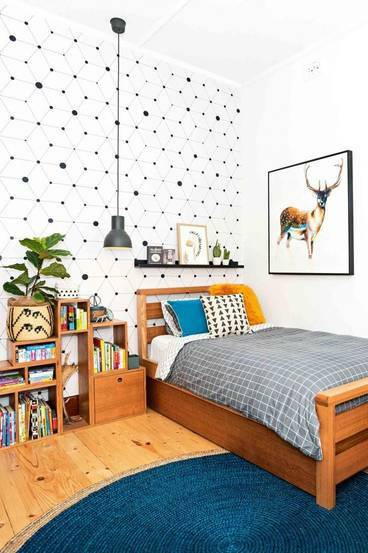 Try geometric patterns, polka-dots, plants, birds or clouds on either the walls ceilings or both. We all know kids love adventure, whether it be searching amongst the gardens in the backyard or creating an adventure of their own at the playground. 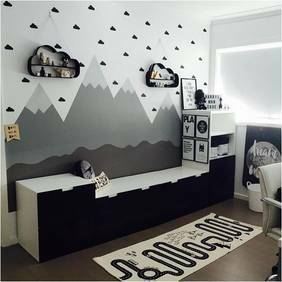 So it’s no surprise that adventure themed kids rooms have become a must have this year. You can be bold and courageous, by incorporating ropes, rock climbs, ladders and swings into your kids room, but let’s be honest, it’s not super practical! Creating a subtle adventure theme can be as easy as decal stickers of mountains, forest wallpapers or building a teepee for kids to make into a secret hideaway. Textured woven wall hangings bring a slight boho feel to the room. 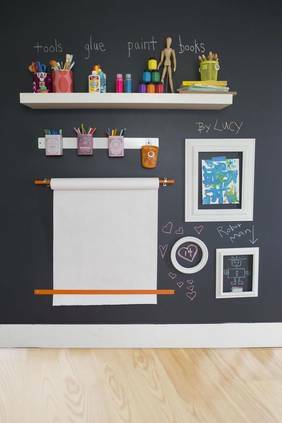 If you really are struggling to find one that fits your kids room, then you can always create your own as an activity! Add some feathers, braids and macrame and you have yourself a masterpiece. They are supposed to be rustic and authentic so don’t stress if yours isn’t the finest of the bunch. The kid’s will love it! TIP When creating a wall hanging, always keep a style board handy so you stick to the style of the room and don’t go to crazy. You can find example style boards in Designbx’s Shop the Look. While you’re busy creating a work of art, keep the kids busy making their own creation. Play Doh is launching their Touch Shape to Life Studio this Spring. Kids simply create a Play Doh character, place it in the studio and scan it to a phone, using the app, to see their creations come to life. 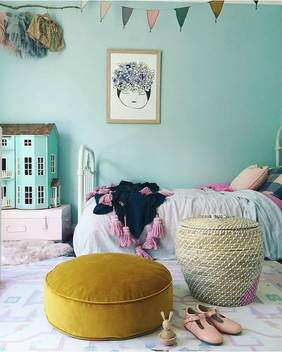 Pouf cushions are replacing seats in kid’s rooms. They are especially popular with kids because they are not only a seat but a thing to climb, but something to roll on, jump on and hide behind. They come in all different shapes, colours and sizes and such a simple thing can bring excitement to an inquisitive little mind. Your kids will wear out before the pouf does. Fairy lights aren’t only for girl’s rooms, there are various different styles and colours that can lighten any room up. Drape them across the bed end, along the roof, across dressers or around window seals. Plus they keep away the monsters at night. 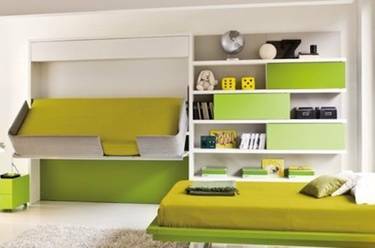 Whether you fold them, roll them or hide them under the flooring, space saving beds are becoming a common occurrence in kids rooms. Traditionally, a bed takes up most of the bedroom floor space, but with tuck away beds, kids can get the best of both worlds. A huge playspace during the day and a cosy bed at night. 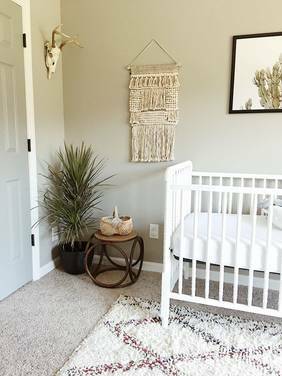 Designing a nursery is an exciting task, but it’s easy to go over the top. Remember they don’t need a nappy change table for long, so only keep the necessities in the room. You don’t want to be tripping over toys (that your newborn can’t even play with yet). Cribs, change tables, nappy bins and especially arm chairs are the basics you should have. 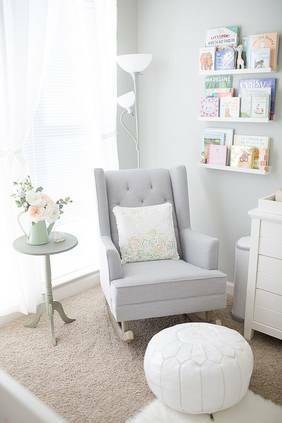 Arm chairs are a timeless piece of furniture and even after your little one has grown to big to be nursed, it can hold all your memories. Keeping the design and colour simple will allow for the chair to stay in the family home forever. For a timeless arm chair head to Designbx’s Nursery. For more style boards, tips, tricks and help, we are here to help! Let Your Imagination Run Wild with more ideas from Top Reveal.